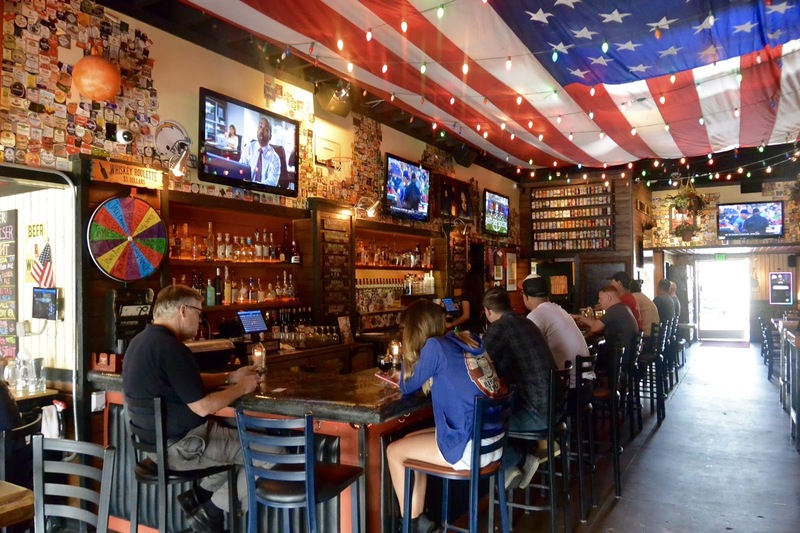 Harbor Town Pub - Guess Who's Back? 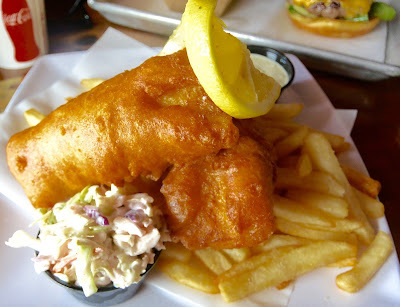 - San Diego Dining Dish! Harbor Town Pub - Guess Who's Back? It's been awhile since I've paid a visit to one of San Diego's most beautiful neighborhoods, Point Loma. The hilly coastal community is easily one of the most desirable zip codes in San Diego, with quiet bay beaches, vista views, and easy access to downtown and the airport. These days, though, I rarely go down there. I think it's the whole mom thing that's keeping me a little busy? 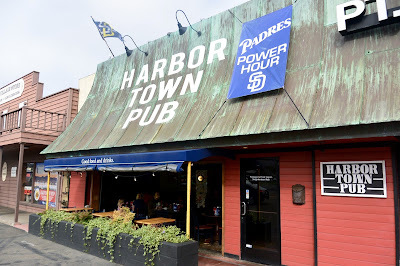 However, I was there TWICE this week for a playdate and to re-visit Harbor Town Pub. The outside is just that of a Point Loma pub, with deck tables and a nice wall surrounding the deck (great for keeping little ones inside!). 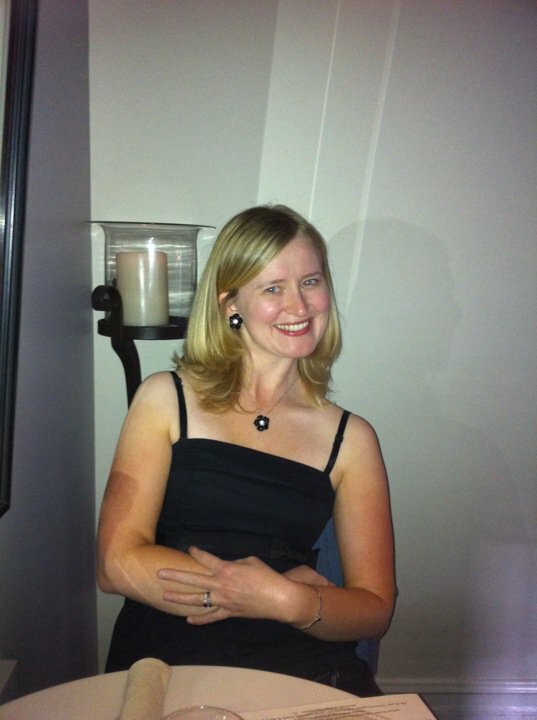 It's very nice and breezy, with heaters to keep everyone cozy on colder evenings. The inside is an explosion of colorful Americana, very fitting to the neighborhood (there's a huge Navy presence in Point Loma). 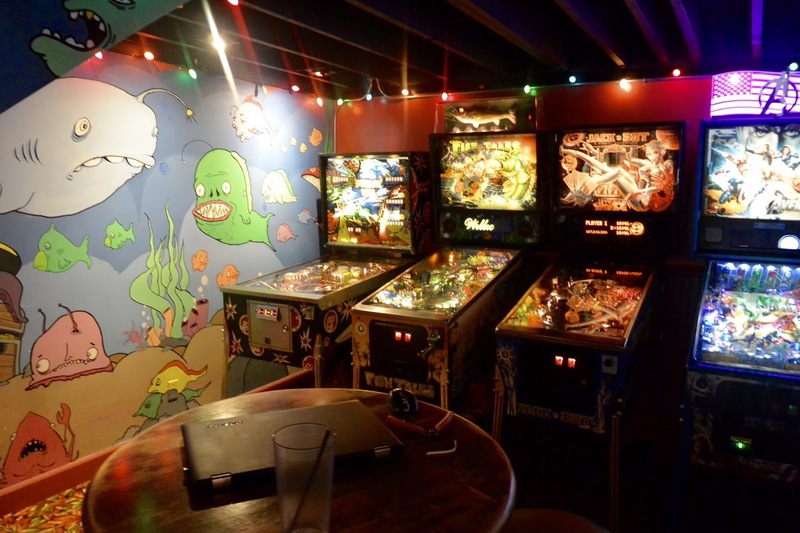 Gleaming against the back wall are loads of vintage pinball machines. What is more American than pinball? Don't answer that, pinball is exclusively American. 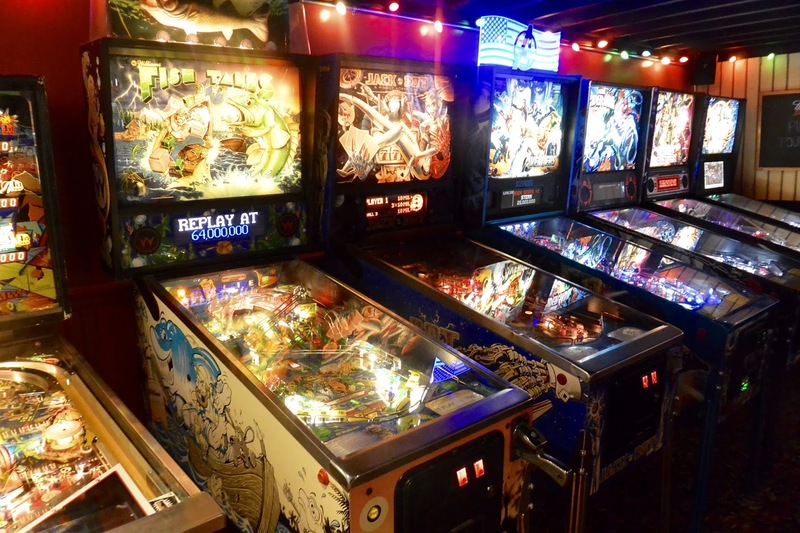 Those gorgeous machines are just begging to be played and enjoyed! Yes, the pinball machines are delightful, but the food was amazing! 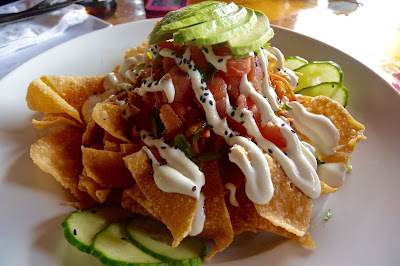 We started with the Ahi Poke Tostada, which was more like poke nachos! The "chips" were fried wontons, topped with everything delicious: fresh, raw ahi tuna, avocado, cucumber slices, and finished off with a healthy drizzle of wasabi cream and sesame seeds. It was really a meal by itself. Huge and definitely an appetizer to share. Harbor Town is totally family friendly! 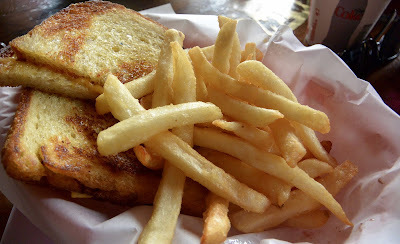 There is a nice kids' menu with choices like a grilled cheese to keep the kids fed and happy. My daughter loved her sandwich! When you go to a pub, you have to get a burger! Harbor Town has a huge selection of burgers, and when you don't know what you want, you want the burger. 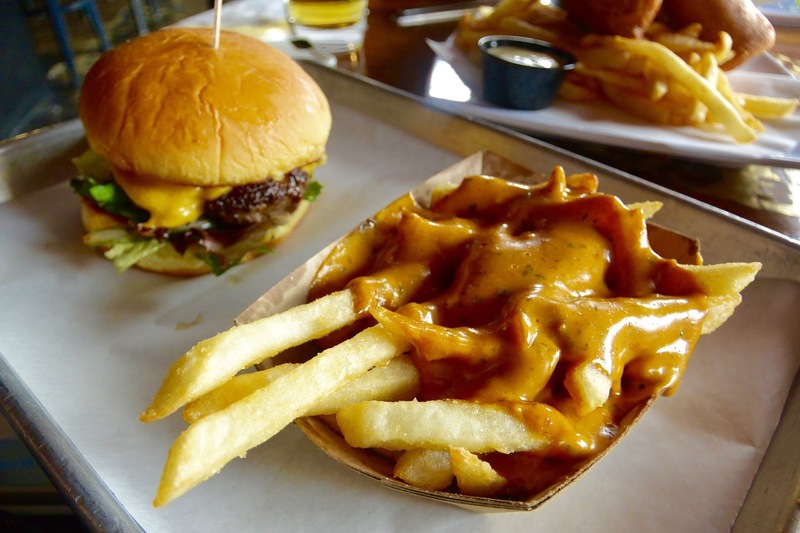 Big, juicy, and served with regular, garlic, sweet potato, or cheesy bacon fries! Pair it with one of the beers from the extensive tap list for the full experience. 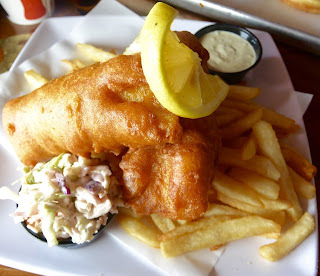 The fish and chips are a mountain of a meal. Two quarter-pound fish fillets, a pound of fries, and a side of cole slaw -- everything that you need for the classic pub meal. Like the burger, fish and chips is best paired with a great beer, and is best eaten in the company of good friends or sitting in front of good television. I really love how Harbor Town manages to be a great adult place yet kid-friendly at the same time. I will definitely head back for the poke appetizer. And they have a Happy Hour! Monday through Friday from 3 PM-6 PM $5 Draft Beers, $5 House Wines, $5 Ballast Point Spirits and $2 BBQ Pork Sliders!